We offer an in-house and on-site repair service for all types of Lifting and Material Handling Equipment. 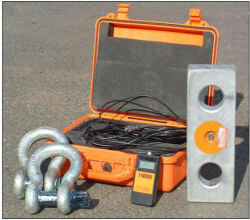 All Lifting Equipment is returned with a Report of a Thorough Examination. A complete on site inspection service carried out by experienced engineers with the minimum disruption to your work schedule. We colour code the equipment so that your staff will be confident in the knowledge that the equipment has been recently inspected. The customer is provided with a detailed report confirming the condition of the equipment and also when it is next due for inspection. We offer all our clients the service of informing them when their lifting equipment is due for inspection or testing, free of charge. We can assume total control of your tackle store from resourcing and managing your equipment to regular inspections and maintenance, managed by one of our engineers.